On Tuesday, Indiaâs representative to the UN termed Al Husseinâs report on Kashmir an attempt to legitimise terrorism in the Valley. 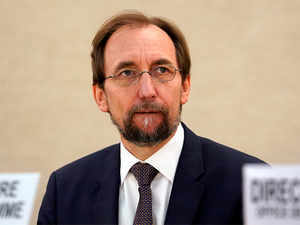 India and Indonesia have separately slammed but found a common cause against the office of the United Nations Commissioner for Human Rights Zeid Raâad Al Hussein. This development that comes close on the heels of Al Husseinâs report on alleged human rights violations in Kashmir and ahead of a potentially similar report on Indonesiaâs Papua province. Indonesia, the country with the worldâs largest Muslim population and a su pporter of Indiaâs position on Kashmir in the Organisation of Islamic Conference (OIC), has expressed its displeasure with Al Husseinâs office for scheduling visits to Papua province for monitoring human rights situation without coordinating with the local government. It said that this was tantamount to violation of sovereignty of a UN member state. Indonesia has consistently opposed strong statements by the OIC against India on Kashmir. During Prime Minister Narendra Modiâs visit to the country last month, India and Indonesia had decided to launch deradicalisation initiatives. On Monday, Indonesiaâs permanent representative to the UN, Hasan Kleib, denounced the office of Al Hussein for failing to coordinate Al Husseinâs trip to Papua province with the Indonesian government and then declaring that he was not provided access. On Tuesday, Indiaâs representative to the UN termed Al Husseinâs report on Kashmir an attempt to legitimise terrorism in the Valley. Kleibâs statement came in response to Al Husseinâs references to Indonesia in his statement in Geneva. In his statement, Al Hussein said that Indonesiaâs invitation to him to visit Papua, which was delivered when he had visited Indonesia in February, had yet to be fulfilled. In response, the Indonesian representative said that Indonesia had invited Al Hussein as high commissioner to visit Papua and West Papua provinces. The invitation was intended to provide him first-hand information on sustainable human rights improvement as well as challenges in the regions, he said. However, Kleib said that Al Husseinâs office did not coordinate his planned visit with the authorities in Indonesia and unilaterally arranged dates and places to visit in Papua and West Papua while demanding immediate access and later alleged that he was denied access by the Indonesian government.